Standing for Doing Everything Well and Wishes Coming True, this 8" beautiful rubber finish golden pig statue features of stepping on Ru Yi and Chinese coins. Having this beautiful golden pig statue at home is also the symbol of success, power and authority for Chinese lunar year of pig. In ancient China, only emperor or very high rank people had authority to carry Ru Yi. In practice feng shui, people use golden ru yi or jade ru yi to represent wealth, success and prestige. It can help you Wishes Coming True. 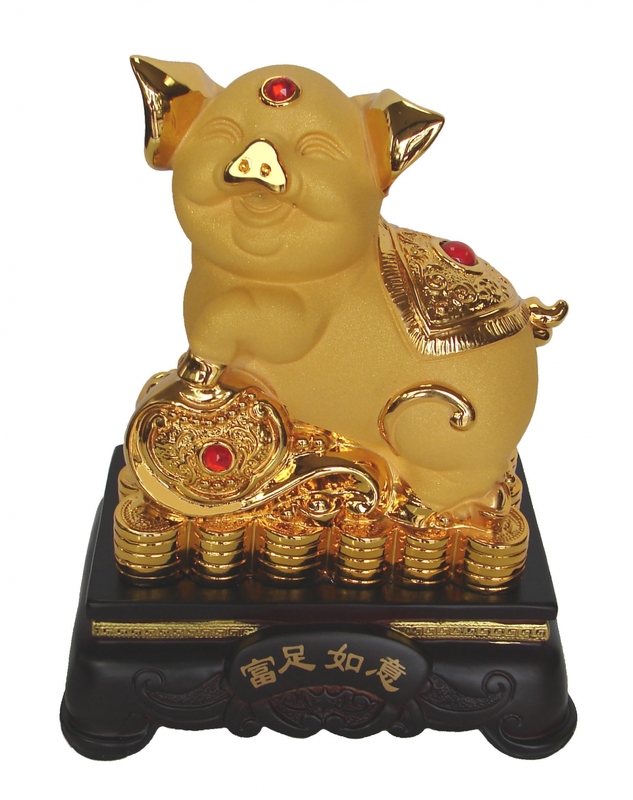 The Chinese words on the stand are "Jin Zhu Ru Yi" that stands for Golden Pig Helping Wishes Coming True.